This was the best thing we ate last weekend. It was amazing! The chicken was good on its own, but was over the top delicious with the pasta. I marinated the chicken in a chipotle and greek yogurt mixture. The chicken was very tender and juicy, and packed a ton of flavor without being spicy. This marinade would go well with my Pollo Loco recipe as well. The sauce is a combination of enchilada sauce and Alfredo sauce. I made my own enchilada sauce, but you can substitute a cup of canned sauce if you don't want to make your own. We finished the dish off with some green onions and tomatoes. We both gave this two thumbs up! This will be a staple at our house! Combine the ingredients for the marinade and pour over chicken. Refrigerate for several hours up to overnight. Grill chicken until done, 12-15 minutes. While chicken is cooking, boil pasta according to package directions and drain. In a medium sauce pan, whisk together all ingredients. Bring to a boil and cook for 5 minutes, stirring constantly. Toss pasta and sauce together. To serve, place 1/4 of pasta in a bowl or plate. 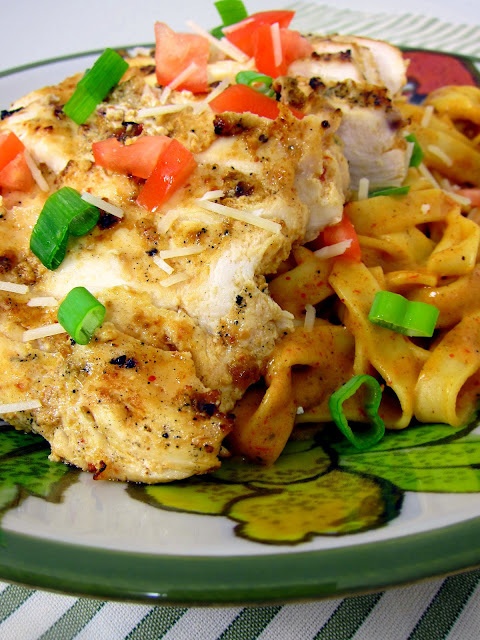 Top with grilled chicken and chopped green onions and tomatoes. Just about anything with pasta or rice is a big hit at our house. The flavors on this look fantastic. This looks delicious but is there something else I could substitute for the Greek Yogurt? My husband and I neither one like yogurt. Perhaps sour cream instead? Greek yogurt is not tart like other yogurts. 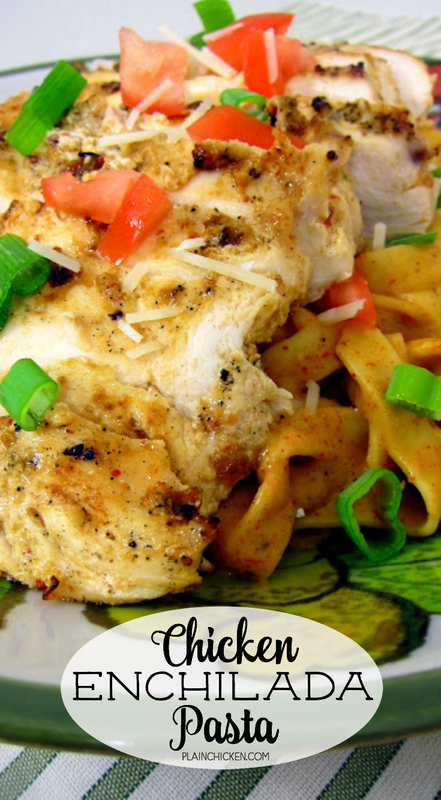 It is fabulous as a marinade which makes chicken more moist and tender. You probably won't notice the taste. Oh my this looks so yummy..I'll have to save this recipe for a later day. I just recently discovered your blog and I must admit, everything you post looks absolutely delicous. Thanks for sharing another tasty looking recipe! Gerontologist - you can substitute sour cream, but you can't taste the Greek yogurt. It is great to tenderize the chicken. I don't like Greek yogurt either, but I love this chicken. Unknown - Caldo de Tomate is a tomato/chicken bouillon. It is in the mexican section at the grocery store or Wal-Mart. Thaqt looks delicious Steph and your shots are really bright and clear. I forgot to ask--how spicy it? Is it kid friendly? This looks so delicious! All of your recipes look so interesting and creative! Yummy. WOW, bookmarked this stunning dish, I gotta make this!!!!!! Those noodles draped in that sauce - just yum! Looks delish...BUT, if you use canned enchilada sauce, would you just mix a whole can of the enchilada sauce with the alfredo sauce and leave out all the other sauce ingredients??? Thanks!